Babydoll Sheep are the traditional type of small and short legged Southdown sheep. The idea and progress in reviving the characteristics of the original Southdown sheep began in America. "In 1986, Mr. Robert Mock began a search for the sheep with the original blood lines that conformed to the original Southdown of the 1700s." To distinguish these small sheep from the larger modern-era Southdown, Mr. Mock named them “Olde English Babydoll Southdowns.” The following information gives the earliest and most significant descriptions of the traditional small Southdown Sheep as they were bred in the late eighteenth century and subsequent breed standards help to chart the changes bred into the original sheep that had roamed the South Downs since before the Norman Conquest of 1066.
" One thing is very remarkable as to the sheep: from the westward till you get to the river Adur all the flocks have horns, and smooth white faces, and white legs; and a hornless sheep is rarely to be seen: but as soon as you pass that river eastward, and mount Beeding-hill, all the flocks at once become hornless, or, as they call them, poll-sheep, and have moreover black faces with a white tuft of wool on their foreheads, and speckled and spotted legs: so that you would think that the flocks of Laban were pasturing on one side of the stream, and the variegated breed of his son-in-law Jacob were cantoned along on the other. And this diversity holds good respectively on each side from the valley of Bramber and Beetling to the eastward, and westward all the whole length of the downs. If you talk with the shepherds on this subject, they tell you that the case has been so from time immemorial: and smile at your simplicity if you ask them whether the situation of these two different breeds might not be reversed? However, an intelligent friend of mine near Chichester is determined to try the experiment; and has this autumn, at the hazard of being laughed at, introduced a parcel of black faced hornless rams among his horned western ewes. The black-faced poll-sheep have the shortest legs and the finest wool." Gilbert White was a pioneering naturalist who inspired Charles Darwin with his observations and this passage comes from a letter to The Honourable Daines Barrington published in 'The Natural History and Antiquities of Selborne' first published in 1789 (it has been in print ever since). He provides a simple but clear early description of the Southdown with the black face with a white tuft of wool on the forehead. The inclusion of short legs in his description, at this early date, is worthy of note. This renowned naturalist gives an unbiased description of the Southdown sheep that roamed the South Downs. It's significant to somebody interested in the features of the original Southdown sheep that the shepards said this is how they have been since time immemorial. To me this provides a compelling and unbiased account of the original Southdown as they were just before the breed was altered or 'improved' to meet the changes in the sheep market. Later writers tend to be breeders who sought to modernise and improve the breed and their detailed descriptions chart the changes made to the breed. The four Vallies, which separate the Sussex Downs, are those of Arundel, Shoreham, Lewes, and Seaford. The part which is included between the Hampshire hills, and the valley of Arundel, is called the "West Downs" : —the other four divisions—the "South Downs" ; —probably, in contradistinction, to the Downs of Surrey ; which, as has been shown, are situated to the north of them. To speak of the South Downs, with greater ease and precision, it will be convenient to subdivide them, into the middle or main downs, included between the vallies of Arundel and Lewes ; and the east downs, comprising the two smaller compartments, to the eastward of the valley of Lewes. The INFORMATION, which I gained, respecting this department of the Chalk Hills, was gathered, in repeated excursions from Petworth, and was confined to the three most westerly, or principal divisions. The two, to the eastward, which are comparatively small, I had not a favorable opportunity of examining. Eastward of the valley of Arundel, and to the easternmost extremity of this Division, a breed of sheep are found, of a description, very different from those of the West Downs, and still more widely, from those of the Western Division, —in stature, frame, color, and wool: though, by no means, so select, and uniform, in these respects, as the Wiltshire breed. This distinct breed of sheep is well known, in many parts of the South and West of England, by the name of the South Down breed. The individuals, as has been intimated, differ somewhat, in their frame and wool, and more in their countenances. What may be considered, as the true South Down sheep, I conceive to be of the following description. The carcass thick ; yet some what loose ; owing to a deficiency, behind the shoulders. The legs of a middle length, and the stature, altogether, of the middle height ; (between the small heath sheep, that are found in various parts of the Island, and the Wiltshire breed). The bone of the legs rather large ; yet their flesh is of a good quality. The head and neck thick, and short. The fleece remarkably close, and fine ; and long, considering its fineness : particularly full, on the neck ; giving the head a muffled appearance. The face and legs black, or dark grey. The head invariably poled, or hornless. But, in looking over the flocks of these Downs, great deviations, from this standard, are observable ; particularly, in a thinness of carcass, an openness of fleece, and in the color of the legs and face. On examining, with some attention, the flocks on what may be called the Brighthelmston compartment of the South Downs, beside remarking on the unevenness of their form, I took the following notice of their color : —-about half the ewes, with white or slightly colored, one fourth, with mottled, and one fourth, with black, legs and faces. Some of the lambs, with mottled carcasses. And, on examining two separate, and large flocks, on the adjoining compartment, included be tween the vallies of Shoreham and Arundel, I observed a similar disparity, and want of evenness, in frame, and color. Of the origin of the Southdown breed, or how long it has been confined to the narrow limits, within which, until lately, it has been kept, I have never heard the least intimation. On my first view of it, in 1791, it appeared to me a matter of surprise, that a breed, so very different, in many essential properties, as well as popular marks and distinctions, from every other, I had, then, more particularly examined, should have found their way into, and retained exclusive possession of, this small tract of country. But having, since, seen the breeds of the West SOUTHERN CHALK HILLS. of England, and bestowed much thought on the different varieties, that appear to have sprung, from the native, or ancient breed of the western mountains, I see nothing in the South Down sheep, to show, that they are not, merely, a variety of this original stock. Nor can I discern any other characteristic, in the poled, grey-faced sheep of the South Hams of Devonshire, and the poled, grey- faced sheep of the South Downs of Sussex, than what soil, or rather food, and climature, may have given. There appears to me nothing, either in the size of the carcass, or the length of the wool, which these may not have effected. And I have no doubt of a breed of sheep, resembling that of the South Downs, being, even yet, to be raised from individuals which might be chosen, from the unreclaimed flocks of Devonshire and Cornwall. Whatever attention may, heretofore have been bestowed on this breed, it was pretty evident, at the time I first examined it, on its native hills, that little attention had, for some length of time been paid to it : even the best flocks, I then saw, were very uneven ; and, evidently, in a state of neglect. About, and since, that time, some considerable attention has been paid to it ; especially on the East Downs.✝ But with what success, I am not able to speak, with sufficient knowledge of the subject : not having had a favorable opportunity of examining the new variety, on its native ground. And as there appears to be doubts, as to the nature of the improvement, yet effected, I forbear to risk any remarks of my own, on this part of the subject. ✝ Particularly, I believe, by Mr.ELLMAN, of Glynde, near Lewes. 'The head small and hornless ; the face speckled or grey, and neither too long nor too short; the lips thin, and the space between the nose and eyes narrow ; the under jaw or chop fine and thin ; the ears tolerably wide, end well covered with wool, and the forehead also, and the whole space between the ears, well protected by it, as a defence against the fly ; the eye full and bright, but not prominent ; the orbit of the eye (the eye-cap or bone) not too projecting, that it may not form a fatal obstacle in lambing ; the neck of a medium length, thin towards the head, but enlarging towards the shoulders, where it should be broad and high, and straight in its whole muse above and below ; the breast should be wide, deep, and projecting forwards between the fore-legs, indicating a good constitution and a disposition to thrive. Corresponding with this the shoulders should be on a level with the back, and not too wide above ; they should bow outwards from the top to the breast, indicating a springing rib beneath and leaving room for it ; the ribs coming out horizontally from the spine and extending far backward, and the last rib projecting more than the others; the back flat from the shoulders to the setting on of the tail; the loin broad and flat; the rump long and broad; and the tail set on high and nearly on a level with the spine ; the hips wide ; the space between them and the last rib on either side as narrow as passible, and the ribs, generally presenting a circular form like a barrel ; the belly as straight as the back; the legs neither too long nor too short ; the forelegs straight from the breast to the foot, not bending in at the knee, and standing far apart both before and behind ; the hocks having a direction rather outward, and the twist, or the meeting of the thighs behind being particularly full, the bones fine, yet having no appearance of weakness, and the legs of a dark colour ; the belly well defended with wool, and the wool coming down before and behind to the knee and too the hock ; the wool short, close, curled, and fine, and free from spiry projecting fibres'. John Ellman's was one of the foremost breeders of Southdown sheep from 1780 to 1829 who did much to publicise and popularise the breed through his program of improvement. "No horns; a long speckled face; clean and thin jaw, a long but not a thin neck; no tuft of wool on the forehead, which they call owl-headed, nor any frizz of wool on the cheeks; thick in the shoulder; open-breasted and deep; both fore and hind legs stand wide; round and straight in the barrel; wide upon the loin and hips; shut well in the twist, which is projection of flesh on the inner part of the thighs, that gives a fullness when viewed behind, and makes a South Down leg of mutton remarkably round and short, more so than in most other breeds; thin speckled leg and free from wool; the belly full of wool; the wool close and hard to feel, curdled to the eye, and free from spiry, projecting , or staring fibres. Those flocks not bred with particular care and attention are apt to be coarse-woolled in the breech, but some are fine all over; weigh, fat, from twelve in eighteen pounds a quarter .... The wool is the finest in England, the Hereford alone excepted; the mutton has no superior, and in hot weather does much better than the Norfolk, and they are constantly folded ... all three points of the first importance." I am a little confused why Arthur Young's description of John Ellman's sheep says no tuft of wool on the forehead whilst Ellman's says that the forehead should be well covered with wool. But both accounts describe a speckled face whereas Gilbert White's earlier account describes a black face with a tuft of white of wool on their forehead. There is black and white sketch of John Ellman's sheep that seems close to Gilbert White's account which seems to show a dark (could be black) face with white on the forehead. In his Annals of Agriculture Vol. xxii (1794) Arthur Young records the comments of a large Southdown breeder as they were sent to the President of the Board of Agriculture. Mr. Allfrey observes, that the South Down breed are a far better proportioned animal than any of the West or East Country breed that ever fell under his observation; that they are a small but compačt animal, containing a great weight in small compass: with moderate fattening, the carcass rises to 64 lb. ; that the fore-quarters are heavier than the hind. He goes on to give Mr Allfrey's thoughts about the dark colours in the Southdown. The dusky or sometimes black hue of the head and legs of the South Downs not only proves the original colour of the sheep, and perhaps of all sheep, but the later period at which it was seriously attempted to get rid of this dingy hue. In almost every flock, notwithstanding the great care which is now taken to prevent it, several parti-coloured lambs will be dropped ; some with large black spots, some half black, and some entirely black. Respecting wool, he is convinced, that were the South Down breed to be left in a wild state, they would, in a few years, become entirely black: for there are in all the flocks, every year, notwith standing all the care that can be taken to prevent it, great numbers of black and white lambs; some with large black spots, some half black, and some entirely black. He has had twelve and fourteen of the latter in a year, though he never kept a black lamb or ewe ; from whence he draws the conclusion, that their original colour was black, and that nothing but art and care produced the white wool. The Black Lambs I also well remember.4 They were Southdown Ewes. The Ram I never saw— He was provided by Giblitt the Great Butcher5—and I was told in answer to my enquiries that he was all but white, having a small patch only of Black—I think about the head. The flock was the queerest I ever saw, and every lamb being black in the lot, looks as if there was a positive law of some kind in the matter. I will write to ask if Mr Woodds man6 remembers where the Black was in Ram, but I fear it will not be satisfactorily answered. The Ram appeared cross bred with a good deal of Southdown in him. The original correspondence that identifies the ram as a Spanish ram has not been found. 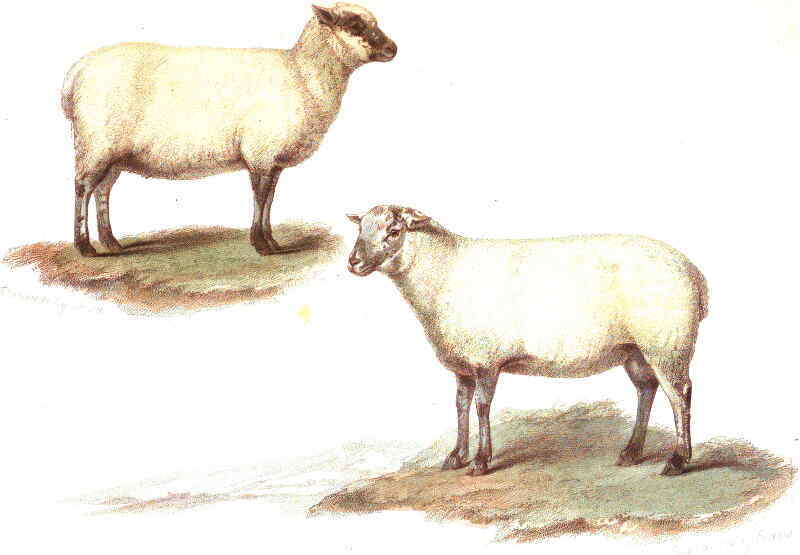 However, as the earlier description in the correspondence says that he had a 'good deal of Southdown in him' then the black colour of the lambs could also potentially have come from the Southdown breed itself. It appears that it was a cross bred ram and therefore how this information can be used to learn about the original colouration of the Southdown is uncertain. These are interesting observations on the appearance of the Southdown Sheep as they were at the time of the passing of John Ellmans son. It is interesting that the patches of colour were more evident in the lambs which concurs with what I have observed in 2018/19 where a black spot on the leg faded over many months to a brown colour. It is also interesting that he talks of 'light brown faces' as compared with many descriptions of them having dusky grey faces. His statement that the true South Down has never a black face seems at odds with earlier accounts like that of Gilbert White. In a good Southdown you look for a head wide and level between the ears; eyes large, bright and prominent; ears of medium size, covered with short wool; face full, not too long from eyes to nose, and of one even mouse colour, not approaching black nor speckled with white; shoulders well put in, the top level with the back; chest wide and deep; back level, with wide and flat loin, the whole covered with firm flesh; tail large, and set on almost level with the chine; thighs full, well let down, with deep, wide twist , ensuring a good leg of mutton; legs a “mouse colour”, and outside the body, the whole of which should be covered with a fine, close and even fleece down to the hocks and knees and right up to the cheeks, but there should be no wool around the eyes or across the bridge of the nose; the skin should be of a delicate and bright pink, the carriage gentlemanly, and the walk that of a thoroughbred. You can see how the breed description has been altered and in some cases corrupted over time. Our Babydoll Sheep are traditional Southdown sheep and our foundation flock was purchased in 2015 from Murray and Judy Peart who at that time owned Hillgrove Stud. During their ownership they maintained a fairly closed flock for breeding with five families of sheep to maintain seperate breeding lines. They said that that they were breeding along the old British lines. These Southdowns were chosen for Dolwen Stud because Hillgrove was one of the earliest Southdown studs and they had taken an active decision not to update their flock to the modern type of Southdown. In the words of the Metcalf brothers they had kept to the "Original Southdown". In conversations with Murry he informed me that where stock was introduced to prevent in breeding that great care was taken in their selection. The ram and two of the ewes that I bought from Murry and Judy were of a smaller stature than the third and very true to type and I was extremely happy with the quality of all of my foundation flock. The rams that we have bought subsequently have also been pedigree Southdowns sourced to have similar old bloodlines which can be traced back through ASSBA Flock Books. They are selected to have the older type of Southdown features. Southdown Australia Inc provide a good description of the characteristics of the modern Southdown sheep.